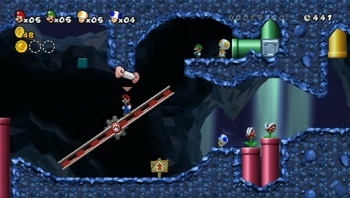 A relatively unknown videogame designer by the name of Shigeru Miyamoto believes that his next game, New Super Mario Bros. Wii, will sell for a while. At a recent Nintendo retailer briefing in Japan, Shigeru Miyamoto made a prediction for how much he thinks New Super Mario Bros. Wii will sell. As reported by Andriasang, during a live play session of the game Miyamoto said: "It's a Mario that will continue selling even after one year has passed." Miyamoto needs to take it easy with these comments or he risks becoming the next Peter Molyneux. I mean, saying that a Super Mario Bros. game will continue to sell even after one whole year? Absolutely crazy! Miyamoto's comment may have something to do with the relatively low, but still successful, sales of Super Mario Galaxy, or he could be reeling from the critical failure of Wii Music, but someone should probably take the red Mario cap off Miyamoto's head and replace it with one that says "Captain Obvious." Last time I checked, New Super Mario Bros. for the DS was still selling even three years after it was released, totalling millions upon millions. Super Mario Bros. is always a staple no matter what system you own, plus it's the easiest thing to recommend to parents that have no clue what to buy their kids. What Miyamoto should have said to really grab people is that New Super Mario Bros. Wii will continue to sell even after a billion years have passed. If the Earth continues to exist for that long, it probably won't even be inaccurate as far as the series in general is concerned.